Last year, Dr. Patricia Kabitzke, PhD introduced animal models in her webinar: Animal Modeling 101 – What are animal models and why are they used in research? In Animal Modeling 102, Dr. Retsina Meyer, PhD expanded upon the previous general overview of animal models, and focused on the frameworks with which translational model systems of post-traumatic stress disorder can be developed and assessed leveraging the clinical literature. Dr. Meyer surveyed existing animal models that putatively model aspects of PTSD phenomenology and discussed how Cohen Veterans Bioscience is working to advance our understanding of the clinical utility of these models and tests. As a translational neuroscientist, Dr. Retsina Meyer’s work spans from human behavioral genetics in psychiatric illness to electrophysiology of learning and memory to the neuroendocrinology of the transition from acute to chronic stress. She has produced over 40 articles, abstracts, and lectures. Her academic discoveries gained international press, earned her a speaking engagement at the local TEDx conference, and served as the instigating discovery to found Resilience Therapeutics, a startup focused on novel treatments for PTSD and other brain diseases. 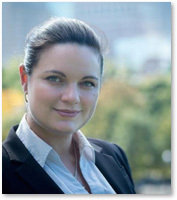 As an entrepreneur, Retsina is an alumna of MassBIO’s MassCONNECT program and SpringBoard’s Life Sciences Accelerator and is the 2014 champion of the international OneStart competition awarded by GSK’s SR One. She serves as a science advocate and worked with the Science Policy Initiative, performing outreach, giving lectures, and meeting with members of congress to appeal for science and scientific funding. She obtained a Neuroscience Ph.D. at MIT where she earned five named fellowships, was a Presidential Fellow, Imperial College of London Global Fellow, and a Graduate Woman of Excellence. Prior to her work at MIT, Dr. Meyer was a Fulbright Scholar, serving as a representative of the U.S. to Norway, where she worked in the lab of 2014 Nobel Prize winners Drs. May-Britt Moser and Edvard Moser. She holds bachelor’s degrees in applied mathematics, biochemistry and molecular biophysics, and biopsychology from the University of Arizona where she was a Baver Scholar, and worked in the laboratories of Dr. David Rowe, Dr. Carol Barnes, and Dr. Bruce McNaughton.